Pate a choux. It’s a fancy-sounding French term that refers to a light, moist pastry dough made of water, butter, flour and eggs. Instead of using baking soda or baking powder or yeast or whipped egg whites as a leavening agent, its high moisture content creates steam that puffs the pastry while it bakes. This simple formula of sorts makes pate a choux incredibly versatile. If you’ve ever had profiteroles, croquembouches, eclairs, crullers, cream puffs, gougeres, or churros, then you’ve had pate a choux. 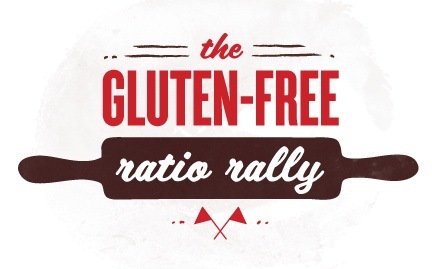 As you’ve undoubtedly surmised, it is the theme for this month’s Gluten-Free Ratio Rally. (As a reminder last month we tackled scones.) If you missed last month’s iteration, here’s the need-to-know about the Ratio Rally… Each month participating bloggers face a new baking challenge. We each make a variation on the common theme, baking (ideally) using ratios and baking by weight. And we have fun while we’re at it. Simple as that. I’ll admit, working with pate a choux wasn’t entirely new to us. We’ve done it at least twice before – once when we made a Chocolate Eclair Cake in February 2010, and once when we made Cream Puffs about one month later. But we haven’t played with pate a choux since then. More than a year has passed, and this time around, we’ve approached the choux with new eyes…that of the ratio baker. Ratios we referenced varied from the elegant (2:1:1:2) to the decimal-happy (1.3:0.7:1.0:1.7) to the ordinary (5:2:3:3). As we tweaked our own pate a choux recipe to hopefully yield both a delicious pastry and a relatively clean ratio, we settled on the rather straightforward 3 parts water : 1 part butter : 1.5 parts flour : 2 parts eggs. Not too shabby. The question of what to make with that dough was another matter. After all, as I mentioned above, pate a choux is a versatile little bugger. The possibilities were nearly endless. At first we were drawn to the idea of making pralines, a choux pastry filled with hazelnut pastry cream. Then we were drawn to the idea of making choux florentines, round pastries topped with whipped cream and caramelized sugar. Then inspiration struck. Some almond paste burning a hole in our pocket (or, at least, calling out to us from the pantry) proved the focal point. We’d make a sort of hybrid between a choux florentine and a praline. Instead of topping the choux florentine with whipped cream and caramelized sugar, we’d top it with a nut-based pastry cream, as in the pralines. But instead of hazelnut, we’d make an almond pastry cream. Hence, almond choux florentines. I’m going to have to start looking for new adjectives to describe our successful baking endeavors, but the result was – to use a word I’ve surely used before – divine. 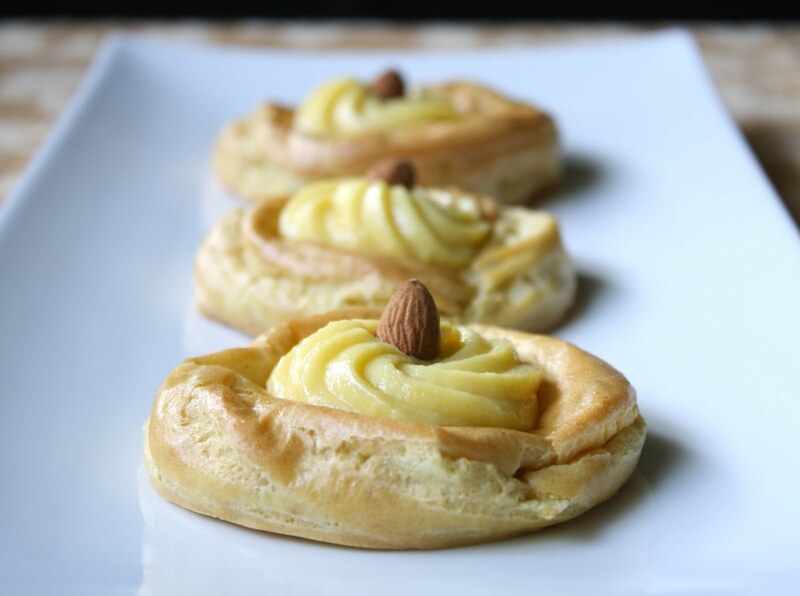 (And yes, we’re biased, but our taste buds also don’t lie…) The choux pastry was light, tender and airy, with a delightful moistness to the inside, pockets of air throughout, and an ever-so-subtle saltiness. 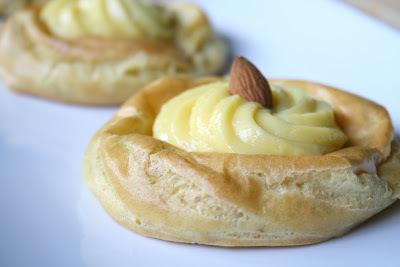 The smooth, sweet almond pastry cream balanced the pastry wonderfully. Personally speaking, my biggest problem with these almond choux florentines was one of self-control. I wanted to eat only one, but ended up having two immediately, and it took no small act of willpower to stop myself from devouring a third straight away. And while they taste great, you might argue that their biggest selling point is that although they sound fancifully French, they’re actually rather easy to make. * The preceding six ingredients should yield 300g pastry cream. 1. Preheat your oven to 375 deg F. Grease a cookie sheet. 2. Add the water, butter, sugar, and salt to a saucepan and bring to a boil. 3. Remove from the heat, add the flour all at once, and stir vigorously until it forms a dough ball and pulls away from the sides of the pot. 4. Transfer the dough to a stand mixer and beat with a paddle at low speed until the dough cools (it will still be warm to the touch). 5. With the mixer at medium speed, add the eggs slowly and beat until they’re completely absorbed and the batter is smooth. 6. Transfer the dough to a pastry bag fitted with a large star tip. Pipe 2.5-inch diameter circles. Then pipe a second circle within each larger circle. Lastly, pipe a second layer of dough on top of the outer circle. 7. Bake at 375 deg F for 20-25 minutes, until golden brown. 8. Let cool on the pan. 9. Mix the sugar and cornstarch in a small bowl. 10. Whisk in the egg yolks, beating until light in color. 11. Heat the milk in a saucepan over high heat to bring to a boil, then remove from the heat. 13. Bring the mixture to a boil, whisking constantly, for 1 minute. 14. Remove from the heat and stir in the butter and almond extract. 15. Stir in the almond paste, whisking to incorporate until smooth while the pastry cream is still warm. 16. Refrigerate for at least 15 minutes, until cool. 17. Transfer the almond pastry cream to a pastry bag fitted with a star tip. 18. 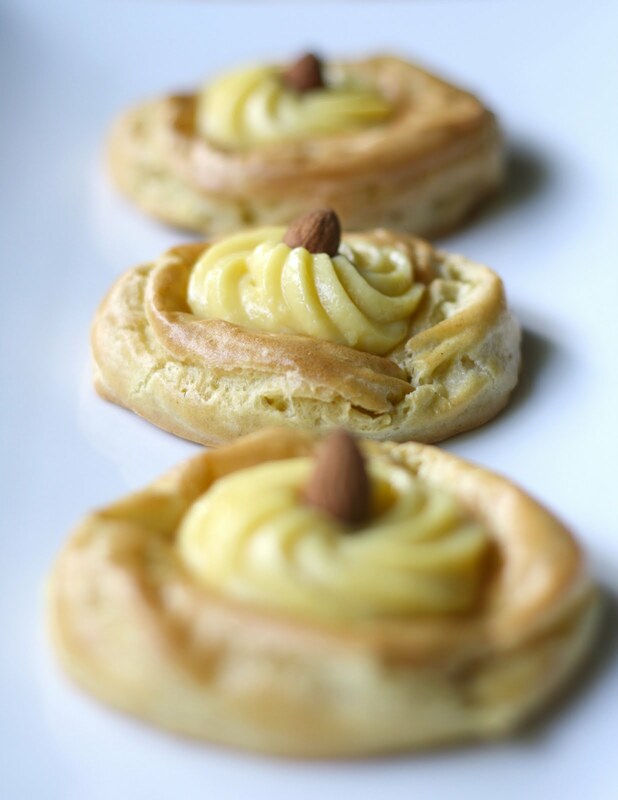 Pipe rosettes in the center of each choux pastry. 19. Top each pastry with a whole almond. This recipe is: gluten-free, peanut-free, fish-free, shellfish-free. Note 1: To aid in making “perfect” 2.5-inch circles of pastry, you can dip the lip of a cup (drinking glass, coffee mug, brandy snifter, etc.) in flour and then “mark” the baking sheet. Note 2: While the pastries turned out great, they can be even better. We ran into two minor (and easily correctible) snags while baking. First, we happened to bake on an unbelievably hot day in a non-air-conditioned kitchen that was 90 degrees. Blech! Secondly, when calculating the weight measurements for ingredients, I made a simple and silly mathematical error that resulted in us using about 30g (about 1/4 cup) less flour than we intended. That additional flour would improve the texture of the pastry and the dough’s ability to hold its shape while baking. Love these, the florentines were such a great idea!! And the choux pastry looks fabulous. leaving out that bit of flour was actually genius because you made them into such a creative pastry. I love the florentine idea and those photos make me want to take one from the plate (I do want one!). 90 degrees is no fun – been there, but those look so awesome. What a gorgeous dessert! I love these photos and have bookmarked your recipe to try later. What adorable mouthsized bites from heaven! I could see myself devouring a whole tray of those. Almond is one of my favorite flavors of all time. 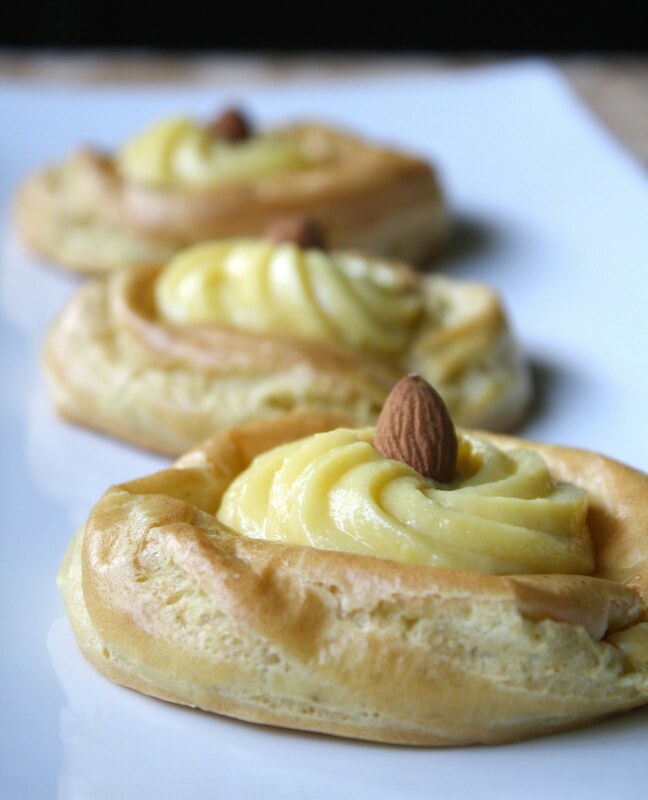 I love what you did with this choux pastry! Umm, yeah! These look really good! I too participated in the rally, but I didn’t get my link in until a few minutes ago. I didn’t know how to create a web address without publishing (but my bf just told me how) so I waited. I also kind of forgot in the midst of all of the rest of my life. Oops. If I get my hands on almond paste, these will be mine! I love the idea of the ration rally. 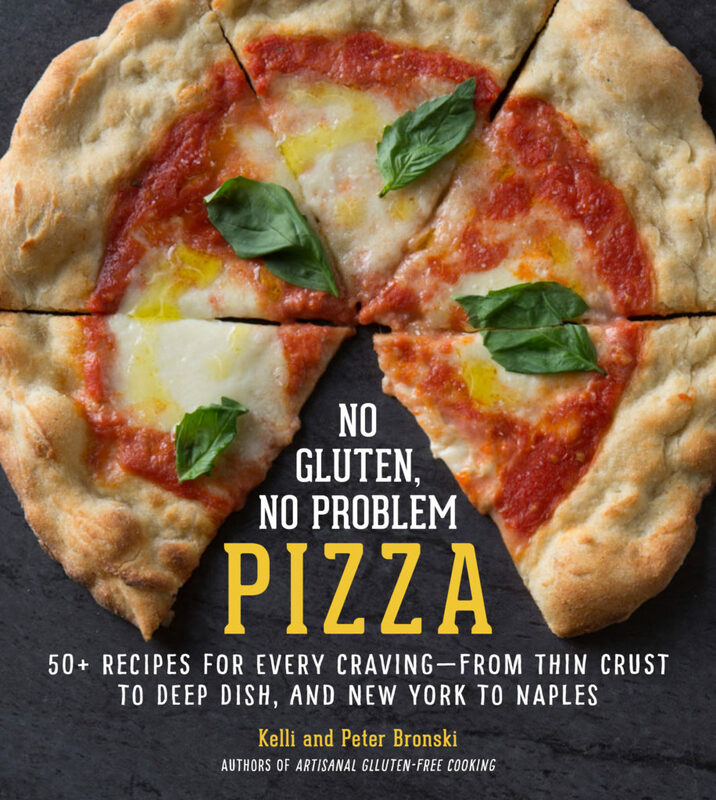 After a year or more, you’ll have to combine them all for your next cookbook. I know it’s not the “politically correct” term anymore, (who would really want to bake a Dutch baby in a cast iron pan anyway…) but would Dutch Babies be another example of Pate a choux? With our budgetary constraints, we do mostly practical food, but we have had great success with GF Puffed Oven Pancakes (aka Dutch Babies) for a breakfast food. The higher protein of the egg seems to be an excellent binder. Hi Jenn… Thanks for your compliment! Hi Charissa… Devouring a whole tray = my constant battle with temptation. Fortunately, they’re almost all gone now! Hi Caneel… We’re big almond fans too! Thanks for the compliment! Hi Amanda… I’m going to run over and check out your post! Your florentines look wonderful! And almond pastry cream sounds like a perfect pairing. I too used almond for some of my pâte à choux – sweet egginess with almond is dreamy! Nice work. Thank you for participating in this month’s GFreeRallychallenge. It was a doozy! Oh, can you please tell us what is your flour mixture? Hi Britt… Thanks! Enjoy the recipe! Hi Tara… Dreamy, I like that description! Hi Erin… Thanks for hosting this past month’s rally! 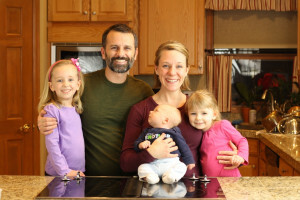 The flour blend recipe is published on our blog. I meant to include a link to it. I’ve updated the post. Enjoy! I have been looking for a gf choux recipe. So using this to make creme puffs this week! Thanks! Hi Preppy… Enjoy! Also check out our slightly different pate a choux recipe for beignets. A slightly drier, firmer dough that might work better for cream puffs.